� Fuerbringer and Jennings played 79 AVP events together and won at least one AVP tournament each season from 2004-08. � Fuerbringer ranked in the top eight in hitting percentage and in blocks per game for each of the five seasons between 2004 and 2009. � Fuerbringer and Lucena played in the gold medal match in Klagenfurt in August 2010 against fellow Americans Phil Dalhausser and Todd Rogers, marking the first all-USA finals match since 2000. � In four of their first six FIVB events together (in 2010), Fuerbringer and Lucena had to play in the qualifier, but in the 2010 season finale the duo was the top-seeded team. � Fuerbringer and Lucena won a silver medal in Quebec in 2011, helping the USA to its first ever podium sweep on the FIVB Tour. 2012: Fuerbringer continued his partnership with Lucena, winning a silver medal in the FIVB season opener in Brasilia. The duo ended the year as the seventh-ranked team in the FIVB season points, but just narrowly missed being the second American team to qualify for the London Olympics, as the bid instead went to Jake Gibb and Sean Rosenthal. In 6 of the 11 events the duo was eliminated by a team seeded third or higher. Domestically they advanced to the semifinals in both AVP events. 2011: Fuerbringer and Lucena played in 14 FIVB events, winning a silver medal in Quebec after knocking off three straight teams seeded sixth or higher. The duo placed ninth in the World Championships in Rome, and ended the season with a fourth-place finish. They were the ninth-ranked team in the FIVB season points. 2010: Fuerbringer started a new partnership with Nick Lucena, and in their first tournament together they advanced to the finals in Fort Lauderdale, but the match was cancelled due to weather. The duo collected their first win together in Virginia Beach. On the FIVB Tour Fuerbringer and Lucena advanced from four qualifiers in the first six events, with a best of fifth place twice, before winning silver in the Klagenfurt Grand Slam. The duo ended their season with a bronze medal in The Hague. 2009: Fuerbringer began the year with a fifth-place finish with Stein Metzger before resuming his partnership with Jennings for seven events. Fuerbringer then played with two different partners, marking the first time since 2001 that he had played with four different players in the same season. On the FIVB Tour the duo earned a silver medal in Poland before placing fifth in the World Championships in Stavanger. 2008: Fuerbringer and Jennings played in seven semifinals, including Manhattan Beach, and in two finals, winning in San Diego. Fuerbringer played one event with Hans Stolfus during the season. He ranked third in blocks per game (1.97) and fourth in hitting percentage (.450). They played in eight FIVB events, with a best of third. They were the third U.S. team in the Olympic qualifying, and were the fourth highest ranked team worldwide not to qualify, due to country quotas. 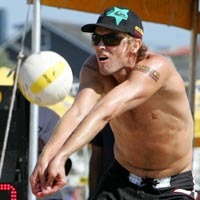 2007: Fuerbringer partnered with Sean Scott for the first 10 AVP events, with a best of third twice. Then he reunited with Jennings and in their fourth event made it to the finals in Boston. They played in one other semifinal before the season finale in San Francisco, which they won. Fuerbringer was the 10th ranked player on tour and placed fourth in the individual event. He was second in hitting percentage (.456) and fifth in blocks per game (1.67). He played four times with Scott on the FIVB Tour, finishing 17th in the World Championships, and once with Jennings. 2006: Seven times Fuerbringer and Jennings advanced to the semifinals, winning in Seaside Heights in their only championship match, marking the fourth straight year the pair had played in the finals in New Jersey. Fuerbringer, the seventh ranked player on tour, was second in blocks per game (2.17) and third in hitting percentage (.475). The duo had a best of 13th in five FIVB events. 2005: Fuerbringer and Jennings played in six semifinals, and three finals. In San Diego the duo won after beating all top four seeds, and also won in Hermosa Beach. He was the sixth ranked player on tour and placed fourth in the individual event. He was third in hitting percentage (.448) and fourth in blocks per game (1.89). 2004: Played in two finals with Jennings, including Manhattan Beach. In Belmar the duo won for the first time, winning four straight matches against teams seeded third or higher and ending a six-match losing streak in finals. The pair didn't return to the semifinals the rest of the season, but Fuerbringer ended as the seventh ranked player on tour. He was fourth in blocks per game (1.98) and seventh in hitting percentage (.422). On the FIVB Tour the duo played twice, then Fuerbringer played four events with two other partners. 2003: Reunited with Jennings and the pair played in the finals of four of the first five tournaments. The duo placed third in Manhattan Beach, and Fuerbringer ended as the fifth ranked player on tour and was named AVP Rookie of the Year. Internationally, the duo played six times with a best of ninth. 2002: Competed in just one event, playing with his ninth different partner in what was his 13th tournament. 2001: Playing four events with four different partners, Fuerbringer had a best of fifth twice, including in Manhattan Beach. 2000: Kicked off his partnership with Casey Jennings in Hermosa Beach, placing 57th. They played five times that year, with a best of 17th, and Fuerbringer played two other events with two different partners. 1999: Fuerbringer began his pro beach volleyball career in Muskegon with Alika Williams, placing 13th. Hot Winter Nights: In 2008 Fuerbringer played six times, playing in the finals in the last five, and won in Madison. In 2009 he competed three times, finishing second twice. College: "Fuerby" graduated from <?xml:namespace prefix = "st1" ns = "urn:schemas-microsoft-com:office:smarttags" />Stanford University with a degree in American Studies. He was named four-time All-American (one of two players who were the first to accomplish that feat), Freshman of the Year, Outstanding Senior Athlete and was a member of the 1997 NCAA National Championship team. He set the record for career kills, and ranked in the top five in career aces and blocks. His final block sealed the only NCAA title for Stanford, which included Mike Lambert and Andy Witt. Personal: Fuerbringer spent five years playing professionally in Europe and speaks fluent Spanish. He has also spent time writing for DIG Magazine. In the off-season, Fuerbringer is the strength and conditioning coach for the Mizuno Long Beach Volleyball Club, which is owned by his wife Joy McKenzie, a former All-American at LBSU. They have a daughter, Charlie, born in 2006, and a son, Mateo, born in 2009.